A simple concept with a powerful message is all it took for Tommey Walker a self-professed commissioned artist, brand manager, and creative problem solver to inspire a city. 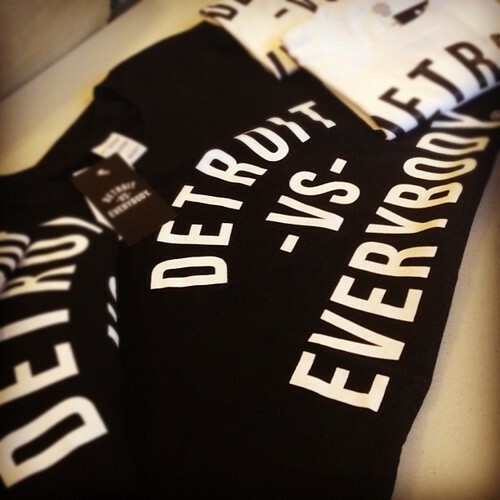 His brand Detroit Vs. Everybody is a line of clothing that seeks to unite the city of Detroit while politely flipping the bird to the rest of the world. Growing up in the downtown Detroit neighborhood of Jefferson and Chene Walker credits the city, his upbringing, and the people in his life for shaping the person that he is today. “I feel like I need to give back, I was poured into in this city…” After a mentor at Tommey’s first job promised to teach him the basics of graphic design conditioned upon him finding enough money to fund a laptop, Tommey made it happen and the rest is history. His break came when he designed the album covers for some of music and Detroit’s biggest names including Big Sean and Mike Posner. Still not satisfied with the amount of negative attention that the city of Detroit received, Walker sought out to inspire the city and promote a unity campaign of sorts. 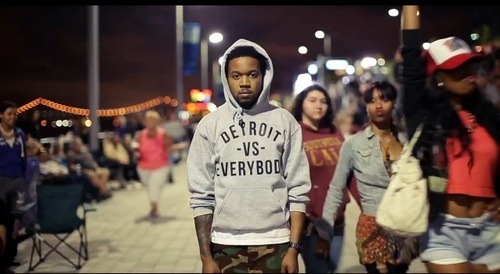 As a result, Detroit vs. Everybody was born and business so far has been booming. Pretty good for someone who left college early after his guidance counselor told him that he had already exceeded the skills that were being taught in his classes. Walker whose mother is a teacher revealed that leaving college prematurely was one of the toughest decisions he’s ever had to make. Even as a student he was being commissioned and doing work for some of the city’s largest ad agencies, after thinking to himself “I’m taking L’s for what I wanted to do in the world…” Walker left Wayne State and pursued his brand and craft full time. The majority of merchandise sold has surprisingly been to out of towners and even to some who aren’t from Detroit at all. But with such a strong message it comes as no surprise that Walker would receive a little flack from individuals living in local surrounding neighborhoods. Tommey admits that he did “want to kinda piss off people, I wanted to give them a friendly competition.” And in the process of doing so, he cleverly has branded himself and the clothing line even further. Most recently the brand has launched The Color Wheel Collection which is the labels signature logo, tees, and sweatshirts printed in almost any color of the rainbow. With lots on the horizon for the brand and himself, Walker who works “for smiles” should get ready to do a lot more of it himself.